LICENSE AGREEMENT WinTools.net is distributed as try-before-you-buy. This means: 1. All copyrights to WinTools.net are exclusively owned by WinTools Software Engineering, Ltd. 2. Anyone may use this software during a test period of 21 days. Following this test period of 21 days or less, if you wish to continue to use WinTools.net, you MUST register. 3. Once registered, the user is granted a non-exclusive license to use WinTools.net. One license gives the right to use WinTools.net for ONE way of these two ways (not both ways! ): a) use WinTools.net personally on one or more computers; b) use WinTools.net if it is installed on a single workstation used nonsimultaneously by multiple people. The registered WinTools.net software may not be rented or leased, but may be permanently transferred, if the person receiving it agrees to terms of this license. If the software is an update, the transfer must include the update and all previous versions. 4. The WinTools.net unregistered trial version, may be freely distributed, with exceptions noted below, provided the distribution package is not modified. No person or company may charge a fee for the distribution of WinTools.net without written permission from the copyright holder. The WinTools.net unregistered trial version may not be bundled or distributed with any other package without written permission of the copyright holder. 5. Registration instructions can be found here: http://www.wintools.net/order.html 6. WINTOOLS.NET IS DISTRIBUTED "AS IS". NO WARRANTY OF ANY KIND IS EXPRESSED OR IMPLIED. YOU USE AT YOUR OWN RISK. 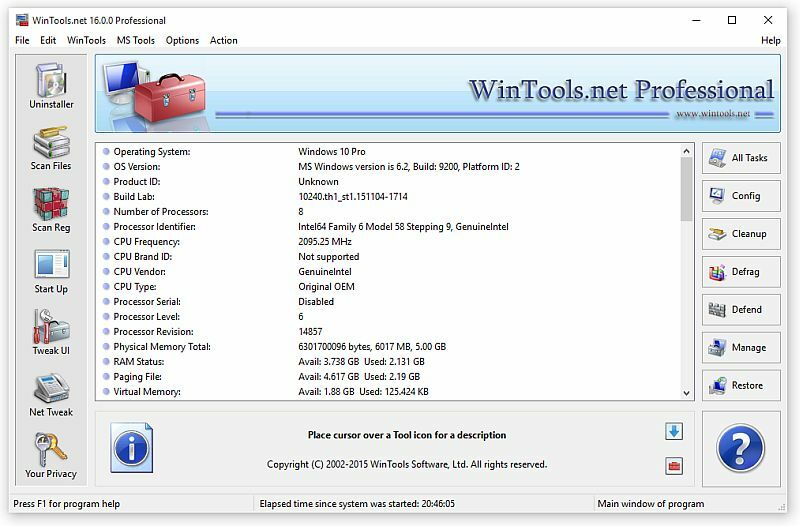 WINTOOLS SOFTWARE ENGINEERING, LTD. WILL NOT BE LIABLE FOR DATA LOSS, DAMAGES, LOSS OF PROFITS OR ANY OTHER KIND OF LOSS WHILE USING OR MISUSING THIS SOFTWARE. LICENSE AGREEMENT WinTools.net is distributed as try-before-you-buy. This means: 1. All copyrights to WinTools.net are exclusively owned by WinTools Software Engineering, Ltd. 2. Anyone may use this software during a test period of 21 days. Following this test period of 21 days or less, if you wish to continue to use WinTools.